Dell Networking, Transceiver, SFP+, 10GbE, ZR, 1550nm, Single Mode Fiber, LCThe Dell™ SFP+ transceiver delivers fiber connectivity to extend the range of your network. This hot-pluggable transceiver with SFP+ (Small Form Factor Pluggable) footprint features a SFP+ connector. The Dell networking 10GbE, ZR SFP+ transceiver provides 10GbE connectivity. 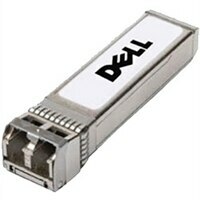 The Dell™ SFP+ transceiver delivers fiber connectivity to extend the range of your network. This hot-pluggable transceiver with SFP+ (Small Form Factor Pluggable) footprint features a SFP+ connector. The Dell networking 10GbE, ZR SFP+ transceiver provides 10GbE connectivity.